I went. I saw (and tasted). Not sure if I conquered, but I did my best. 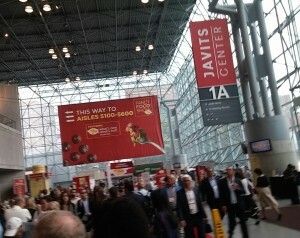 Last week was my first trip to the New York version of the annual bi-coastal specialty food extravaganza known as the Fancy Food Show, put on by the Specialty Food Association It’s at least double the size of the San Francisco show held each January (which I’ve been to 6 or 8 times in the past couple decades), and with about 2500 exhibitors it’s pretty critical to have a game-plan. And to know going in that it’s a ridiculous proposition to consider sampling at even a fraction of all those booths you’ll be passing. I bypassed tons of chocolate, cookies, chutneys, sauces, teas, spreads, pickles, juices, and even–shocking though it may be–cheeses and ice creams. I had my radar out, instead, for savory snacks, butters and anything of interest in the seafood category. Even though sweet stuff seems to easily dominate the millions of square miles (ok, I exaggerate) of floor space, there are plenty of salty-cheesy-spicy-herby-nutty snacks that draw attention. I’ve long had a thing for chickpeas in all forms, saw a number of products expanding their snacky availability. One favorite was the rosemary variety of Chickpeatos, though a number of companies had similar crispy chickpea snacks available. While some may have seen enough of kale chips for the rest of their lifetime, I remain a big fan. Super easy to make at home, I’d included a lemon and ginger-spiked version in Salty Snacks . At a previous Fancy Food Show I’d seen a product that offered whole-leaf kale chips that didn’t rock my boat much, not as crisp and fresh-tasting as homemade. And at a pretty steep price. But the snacks produced by SuperEats I found to be much more successful at translating kale into a commercially-made snackable form. The chips have the satisfying crunch and texture of a tortilla chip, with the earthy-nutty flavor from kale. Sure, they’re super healthy and you can indulge guiltlessly. But they’re also tasty in their own right. 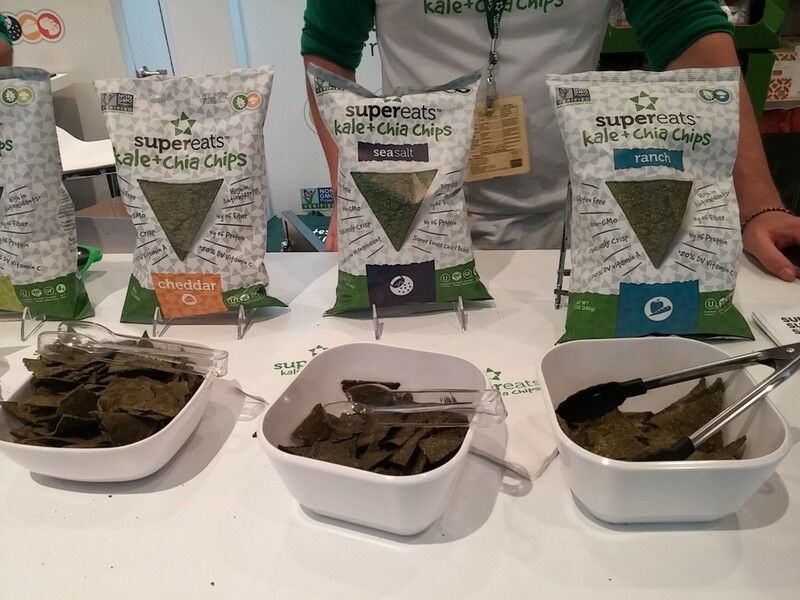 Roasted seaweed is, perhaps, the new kale chip, and a number of companies displayed snacks using seaweed. 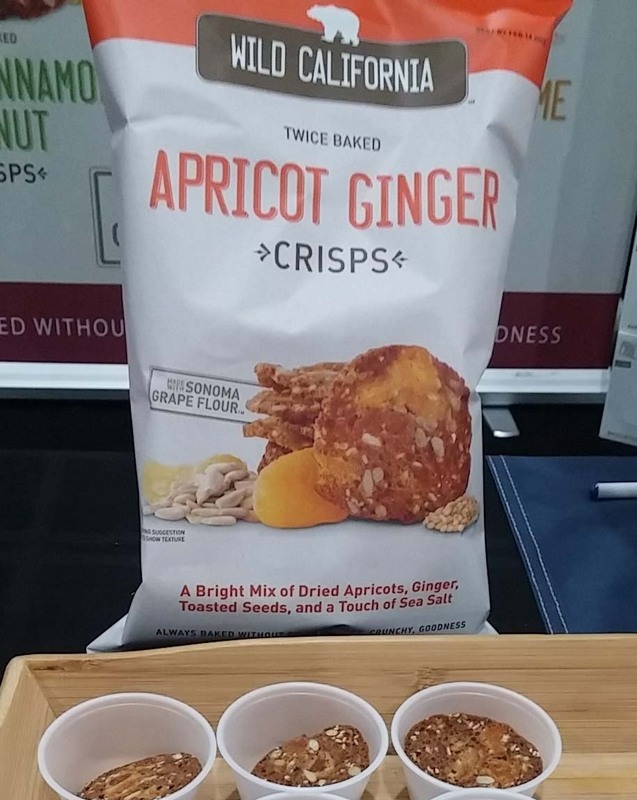 My favorite was from a Korean company that layers accent flavors/ingredients (almonds in one, coconut in another) delicious nutty contrast to the briny-rich sheets of seaweed between which they’re sandwiched. I also really loved the cris ps from Sonoma-based Wild California, which include flour made from the seeds and skins leftover from grape crush at nearby wineries. Used in addition to organic wheat flour, the grape-based flour adds nutrients, texture and perhaps a dash of flavor to the crisps, though I couldn’t detect it. What I love, though, is the sense of place characterized by using a wine-related product and that it turns one industry’s waste into another industry’s resource. It’s little surprise that given our country’s cocktail-crazed frame of mind lately that cocktail mixers were a popular theme at the show. And sure, some are still in the party mode: add tequila, shake, margarita time!! 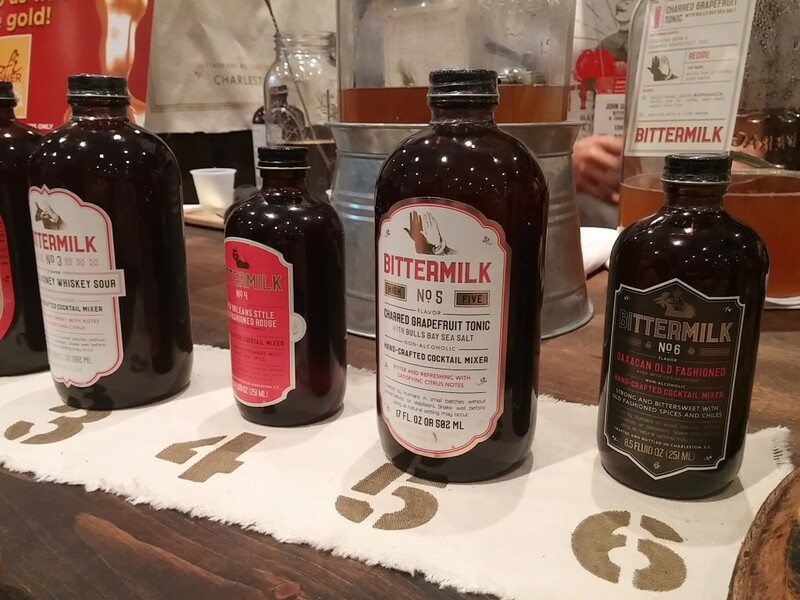 But most are shooting for a slice of the craft cocktail movement, my favorite of which by far was the Bittermilk brand out of Charleston, South Carolina. I saw lots of social media going out about their Gingerbread Old Fashioned mixer, but the one that I really loved was the Charred Grapefruit Tonic. Sadly unable to snag a bottle to bring home with me (it’s a sampling, not shopping, show), I will, however, happily be in Charleston later this year so can pick me up some. That, and visit the bar owned by the founders, The Gin Joint. I’ve been diving back into seafood more in recent years, not the least because of work on my latest book about Pacific oysters that will be released January 2016. I’m never too far from some delicious oysters, crab, salmon or any other seafood about which I’m thrilled to share tips and recipes. So I had my radar out looking for some interesting new products in that category, and found the adventure a little disappointing. Sure, there was some smoked salmon and an occasional smoked fish spread. Purveyors of canned tuna, and a few specialty items (canned octopus or mackerel). But with the big growth in oyster fan-dom lately, I was surprised to see no oyster-specific products. No prepared mignonettes or other oyster-inspired sauces? Not even some artisan oyster crackers (which are admittedly more about chowder than oysters)? Well, readers will be able to make their own from my book. And I predict it won’t be long before there’s a new hipster version of an oyster cracker in markets. Maybe I’ll happen upon them next time I’m plying those aisles at the Fancy Food Show.